Five more sleeps until the wonders of North London supplant those of the Eternal City. I’m already itching to get back and play with my new bungalow but it has to be admitted that there’s some pretty darn impressive stuff here – and that’s not just the number 8 tram. Yesterday we did the Colosseum. The best bit, admittedly, was walking past the line of people who hadn’t reserved a ticket online; the second best bit was when ActorLaddie spotted a small black cat wandering around inside, clearly having been tipped off by some ancestors that this was the place for interesting action. 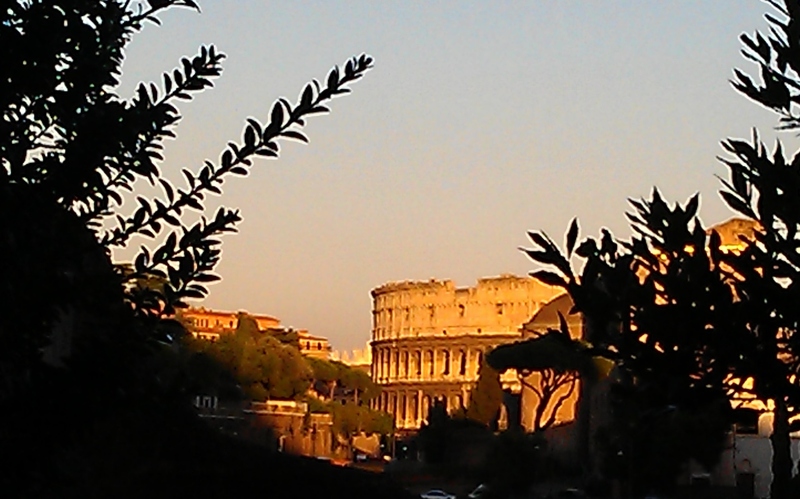 But the view inside the Colosseum comes a close third as it is – and I know this will come as a surprise – so very big. Huge. Immense. If, as Hitchhiker’s puts it – you think it’s a long way to the chemist’s at the top, that is nothing compared to the size of this monument to the human capacity for cruelty. The arena floor has rotted away, so you look down into the passages and dungeons which held those who were about to die. Bread and circuses. From the Colosseum, we then walked through the Forum seeing where Julius Caesar was burned, where Cl-Cl-Claudius walked, where the ancients shopped and debated and worshipped. We’ve seen St Peter’s: its stunning window has been beautifully photographed by fellow-blogger leonardostories here. We’ve walked round the Ghetto and visited the Synagogue; smaller and with less bling that St Peter’s but with a very strong sense of being a sacred space rather than a tourist attraction. We had a fascinating tour of the Villa Farnesina. This was commissioned by an immensely rich and high-class businessman, Agostino Chigi, at the start of the C16th. There he married his mistress – a former courtesan. He had the walls and ceilings decorated with frescoes by the cream of Renaissance artists, including Raphael. They show classical myths of love, particularly those featuring characters with different social backgrounds: such as business-men and courtesans. 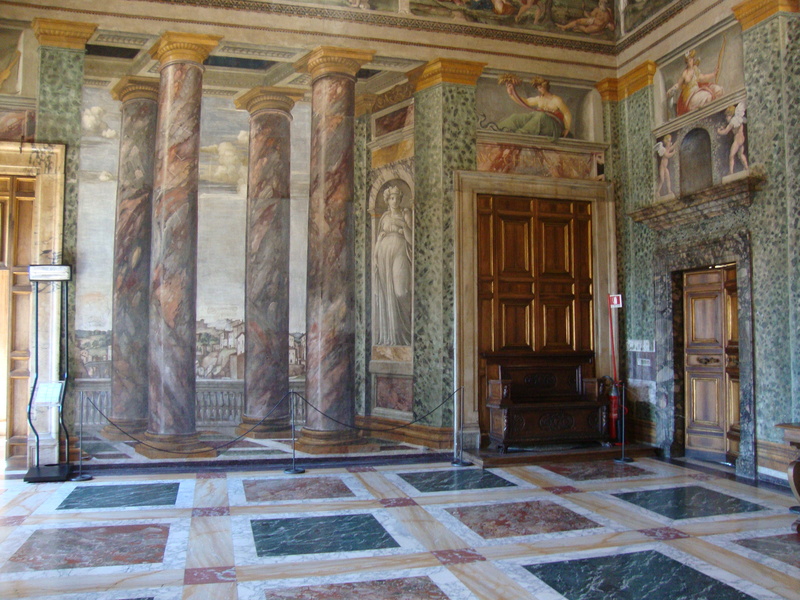 Our favourite was the ‘Perspectives’ room where the walls have a trompe‑l’oeil effect in which the tiling pattern of the floor is continued upwards for a few feet and then topped with painted pillars and the Rome countryside; the overall effect being that you are both inside and outside. We sent a photo of this as a serving suggestion to the chaps at home currently working on our bathroom: it would make a nice change from magnolia. The villa was such a success that it became quite a social centre, with regular bunga bunga parties being held for Chigi’s clients – the Pope, cardinals and, of course, courtisans. Much later, Mussolini took the place over as an administrative centre but the frescoed ceilings didn’t speak to his condition, so Il Duce had them covered with wooden panelling. Which gives us hope for what might be under the polystyrene ceiling tiles of our new kitchen. It is easy to see why Rome has been the inspiration for generations of creative types; infused by stories of both classical grandeur and misery. I presume that is why my dreams are so vivid at the moment, clearly inspired by my surroundings. Last night, I dreamt that I was trying to arrange an induction day for a newly qualified teacher but was being hindered by the fact that a Year One boy had pulled down a water pipe in the toilets. So I stood there with a bucket shouting for the Site Manager while my class rioted in the distance. The night before, I dreamt that I’d moved to a new school. Term started tomorrow but no-one would tell me where my classroom was or whether it was acceptable to put the children into teams. Meanwhile, we were being made to sit through an Inset day on how to teach the piano. The night before that, I was due to take an assembly and my class were refusing to line up. No sooner had I got one lot sorted, than another bunch went off, like trying to herd water. And when we eventually got to the hall, the projector wouldn’t work so I had to cycle off to get a new lead to fix it. Meanwhile, my class were rioting. Again. Sounds like you are having a great time. Perhaps you will dream of teaching Roman children on a field trip through the forum in its better days.